There are 2 ferry routes operating between Ustica Island and Sicily offering you combined total of 36 sailings per week. Liberty Lines Fast Ferries operates 2 routes, Ustica to Palermo runs 5 times per day & Ustica to Trapani about 1 time weekly. As the frequency and duration of crossings on some routes varies we would advise that you do a live search for crossings from Ustica Island to Sicily to get the most up to date information. 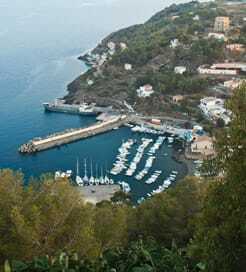 The tiny volcanic island of Ustica measures just 9 kilometres wide and is the oldest of the Sicilian outer archipelago in Italy, approximately 60 kilometres north of Palermo. The island’s origin and its black, lava-covered exterior determined its name, which is derived from the Latin ‘ustum’, meaning 'burnt'. It has a jagged coastline which shelters a series of wonderful caves and bays, too, as well as some magnificent, sparkling grottoes. Also, the surrounding waters are a protected marine area, which makes Ustica a popular spot for scuba divers and snorkelers who flock here for the deep dives, colourful fish, coral reef and excellent visibility. Ustica Island is a popular holiday destination for Italians, so there are numerous crossings back to Sicily, operated by a popular local ferry company. 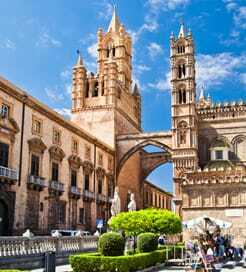 You to sail to either Palermo on the Sicilian north coast or Tapani which is further west.